My trip to the Monte Vista Crane Festival was a wonderful experience. I plan to write more on a few subjects that came up for me, but I’ll do that over at Fierce Planet, my politics blog. 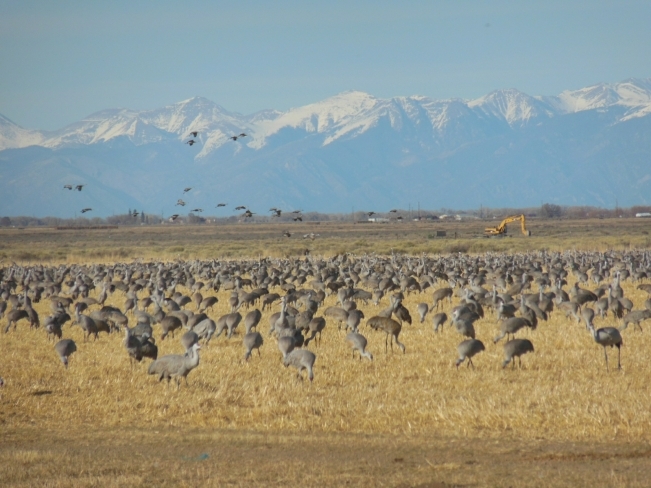 For this post, it’s enough to say that the San Luis Valley was full of Greater Sandhill Cranes, about 20,000 of them overall. Even when they weren’t within sight, you could hear their echoing ping-pong calls all around the place. I was part of tours to two other wildlife sites, and also saw many elk, pronghorns, raptors and lots of other birds. The whole thing was a delight. Highway 285 in Colorado is my favorite road in the state, winding through the mountains across very high desert basins. There are incredibly beautiful views on every side, and I enjoy the drive very much. Before I left on Thursday, I did manage to keep up with my (reduced) ROW80 goals and worked more on the cover art for my book. That continues to go okay. I’ll have more to say next week. In the meantime, here’s the blog hop link for today’s check-in. Off to see how everyone else is doing! This week there will be Cranes! 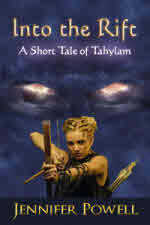 Last week went fine, as I continued to work on my cover art. I seem to have gotten past that sense of eternal disappointment I have with everything I create. So while it was finicky work with lines and nodes, I was able to enjoy the process again. This week I am shorting my goal a bit, as I will be away on vacation from Thursday to Sunday. So only three days of work this week instead of five. 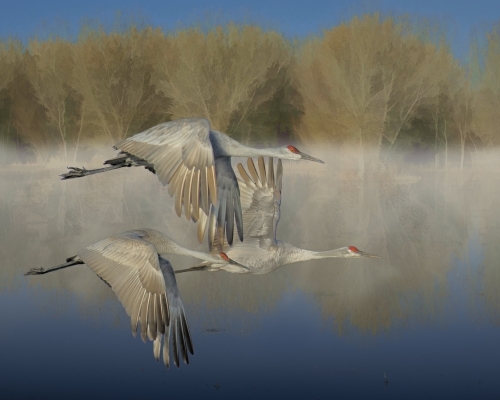 On Thursday I drive off to Monte Vista, Colorado, for the Sandhill Crane Festival. I’ve been through Monte Vista several times, and I’ve seen the crane migration in different places, but I’ve never been to the Festival before. Along with viewing the cranes at sunset, I’ve signed up for two different wetlands tours and plan to sit in on a workshop about owls. Evening entertainment will include a birding movie, “The Big Year”, and a dramatic reading of the works of Aldo Leopold. For a long-time birder like me, this will be a big treat. These cranes were actually in New Mexico. Mr. J has to work so he’ll be at home taking care of the cats, and I’m traveling on my own. I used to travel around the country by myself all the time, but it’s rare now since we usually travel together. I suspect he’ll have a good time with the house to himself. I’ll have my laptop with me, so I will be able to work if I want to. I’m not counting on it though. So, vacation check-in next week. Meanwhile, here is the blog hop link for today’s check-in. I hope everyone has had a productive week as well. While working on an illustration this past week, I had an odd experience. The picture I’m working on has been going well. It’s the first illustration that will have color in it, as it’s meant to be part of a cover. So I spent some time watching tutorials and reading through my software manuals and then started to play with color on a copy of the pic. I decided on some brush types and gradient fills and started to work on my actual picture. And that went well, except that all of a sudden one day I looked at the picture and it looked terrible to me. I hated it, I was sure it was awful, and I became convinced that there was no point in continuing. I recognized the emotion at once, of course, because the same damn thing has happened with every piece of writing I have ever attempted. Somewhere in the middle I loathe the piece, no matter what it is, and I am sure that there is no point in continuing to work on such trash. Who knew that drawing would bring out the exact insanity in me? I never expected it, until it happened anyway. But that’s what I learned, that I’m able to hate on my own work no matter what kind of work I’m doing. Fortunately I was able to keep on working but it gets much harder once that doubt is kind of planted in the project. I can draw back to a more detached view and continue with the illustration, but it’s almost like some dirt has rubbed off on the thing and it never seems quite free of it again. Though I did manage to reach all my goal time for the week, which is great. Anyway, that’s one insight down. I have another that I’ll try to write about in next week’s check-in. For now, here’s the blog hop link for today’s check-in. I am happy to report that my cold has passed on, my hands are in good shape, and I reached all my main goals last week. The artwork is fun to do, and absorbing. This is my first protracted foray into this sort of drawing so perhaps it’s the newness that makes it enjoyable. I am still pretty resistant to the actual writing, and so for the week ahead writing is something I need to work on. In early March I have plans to spend a few days in and around Monte Vista, CO, where I’ll be attending the Monte Vista Crane Festival. Sandhill cranes are some of my favorite creatures in the world. I’ve followed them around Arizona, and around Nebraska, and while I’ve seen them in Colorado this will be my first visit to the Festival. I have spent time in the high plains around Monte Vista and Alamosa before, usually while traveling towards New Mexico and parts beyond. It is a gorgeous landscape, though austere in many ways, where mountain ranges surround wide expanses of rangeland and ephemeral wetlands, and lovely old oxbows of the Rio Grande snake through. I intend to take care of my health over the next couple of weeks so that I can do a little hiking while I’m out there. Here’s the blog hop link for today’s check-in. Time to go see how others are doing! The chest cold that hit our household last weekend turned out to be much harsher than I expected. We both spent two full days struggling to breath, and when that phase passed I felt as if my chest had been kicked by horses inside. I wheezed and coughed for several days after. By Friday I was able to sit down and work for an hour, and I was glad of that, but it was still a struggle. My breathing problems left me with very little energy. So let’s rank last week at only 20% of goal time spent, but there was really nothing that could have been done. When that sort of illness hits all you can do it take care of yourself and wait it out. I am hopeful that I’ll meet goal this week, as long as I take care and don’t push too hard beyond that. I have a few household projects that I need to get done as well, but mostly I intend to get a full night’s sleep every night and keep moving slowly. Meanwhile, here is the blog hop link for today’s check-in. Best wishes to everyone! This will be short, but all is well here in my office. I met all my goals last week, and even a bit more, though some of that was web site work which I don’t usually count as actual book work. But it’s all useful so I’m pleased. My thumb is pretty much back to normal. I’ll continue to take it easy on the drawing so that I can keep it that way. On the less bright side, for the second time this winter Mr. J has brought a head cold home from the office and we’re both hacking and coughing like miserable fiends. So I’ll take it slow the first couple days of this week, and then get on with the work again. Meanwhile, here’s the blog hop link for today’s check-in. Hope things are going well for everyone. I had a bit of a setback last week when my thumb exploded with enormous pain from RSI (repetitive stress injury). This is a problem I’ve had in my hands on and off for years, mostly because I’ve spent so much time on the computer. I’ve shifted to ergonomic equipment which has helped a lot. But it seems that my enthusiastic use of the digital pen and tablet the past couple weeks finally caught up with me. It was a shock, and it hurt, and it led to me spending most of the past four or five days with my left hand in a thumb brace. I did manage to work my full goal hours doing non-stressful work that still advanced the project. As of this morning my hand is almost entirely back to normal so I’ll push on this week. But clearly I need to pay better attention to switching among types of work and let my drawing hand rest and recover. I am very happy overall with my progress in January, and I am determined to keep it up through February. So, same goal for the coming week: one hour a day each weekday, with one session writing or editing. And a new sub-goal: mix in the actual drawing with other types of work, to make sure my hands stay functional. It would be much harder to work without them. Below, after the jump, is an example of the botanical illustrations I’m creating. They are sketched over my own photographs, and I’m still figuring out the best way to resize them for image quality and file size. This one has a medium level of detail; some have less and some much more. I think there will be between six and ten of them in the final project. 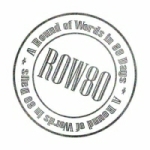 Here’s the blog hop link for today’s ROW80 check-in. Time to go see how everyone else is doing. Last week went very well. I made all five days of my ROW80 goal time: Go me! I completely finished one sketch and started on a far more complicated piece that I hope will end up as the eventual cover. I also took part of one day to work on the manuscript itself, which was my new sub-goal. But first, here’s the blog hop link for today’s check-in. Now I’m off to see how the others are doing. I hit about 95% of my goal time last week, most of it on artwork. Still not quite to goal, but very close. And the best news is that I found the work very enjoyable, and I’m happy with the outcome. I should have this picture done today, and there is more to do after that. But it’s interesting to discover that while sitting down to write still gives me that gnawing anxiety in my gut, these bits of artwork don’t trigger the same fear at all. Still, I want to ease into the writing and see if I can get all these good feelings to spill over there as well. Maybe I can slowly lessen that stress response over time, by enjoying myself as I work. So I will add a potential sub-goal to my ‘one hour a day’ goal: to spend one of those sessions on a writing/editing task. Maybe I can pull that work back into the mix. In the meantime, here’s the blog hop link for today’s ROW80 check-in. I hope everyone else is feeling good too.